Photographs that contain a religious, spiritual, cultural, or historical element as a major feature. Getting this shot was a bit of an accident. 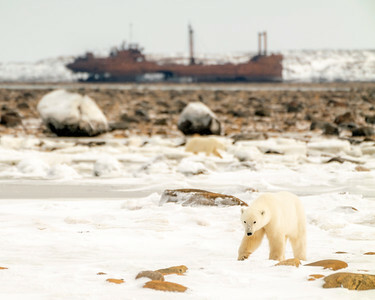 The boat in the background – the “Ithaka” - wrecked on the shores of Hudson Bay in 1960, and is something of a Churchill landmark. I was tracking the bear in the bottom right of the photo, snapping away, and didn't even realize I'd captured him with the Ithaka behind him. AND there was another bear in the shot. I can't believe I didn't realize either of these things until a few minutes later, when I was looking through my recent shots. Sometimes things just work out. Available in the following sizes (Rectangle A): 10x8, 14x11, 20x16, 24x20, 30x24, 40x30. During the fall of 2018, I did a quick tour of cities on the East Coast, and the Midwest. One of the cities I was fortunate enough to photograph was Kansas City, Missouri, and the best view of the city – in my opinion – is from the World War One Museum and Memorial. The most prominent building shown in this photo is Union Station. Available in the following sizes (Rectangle B): 12x8, 18x12, 24x16, 30x20, 36x24, 45x30, 60x40, 72x48. During the fall of 2018, I did a quick tour of cities on the East Coast, and the Midwest. 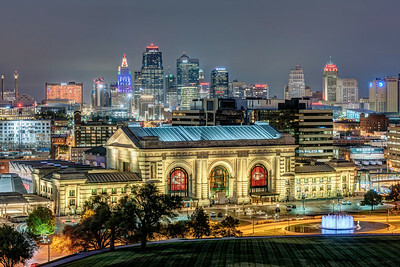 One of the cities I was fortunate enough to photograph was Kansas City, Missouri, and the best view of the city – in my opinion – is from the World War One Museum and Memorial. The most prominent building shown in this photo is Union Station. Available in the following sizes (Panorama C): 30x10, 36x12, 48x16, 48x16 Triptych (3 x 16x16), 60x20, 60x20 Triptych (3 x 20x20), 72x24, 72x24 Triptych (3 x 24x24), 90x30, 90x30 Triptych (3 x 30x30), 108x36 Triptych (3 x 36x36), 126x42 Triptych (3 x 42x42), 144x48 Triptych (3 x 48x48). 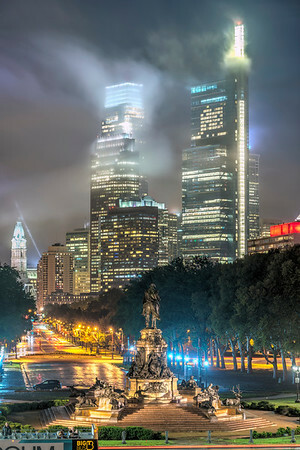 I went on a quick trip to a lot of America's bigger cities in the Northeast and the Midwest in the fall of 2018, and one of the cities I was fortunate enough to visit was Philadelphia. I'd heard no visit to the city would be complete without stopping at the Art Museum Steps (where Rocky went on his famous run), and the view it provided of downtown and “The Oval,” complete with the statue of George Washington. It certainly lived up to the hype! Available in the following sizes (Rectangle B): 8x12, 12x18, 16x24, 20x30, 24x36, 30x45, 40x60, 48x72. I visited a bunch of big, American cities on a whirlwind tour of the northeast and Midwest United States, during the fall of 2018. I had one evening in Washington, D.C., and I spent it wandering the National Mall, taking photos of the famous buildings and memorials. It was a fairly dismal night, which resulted in a very moody sky. 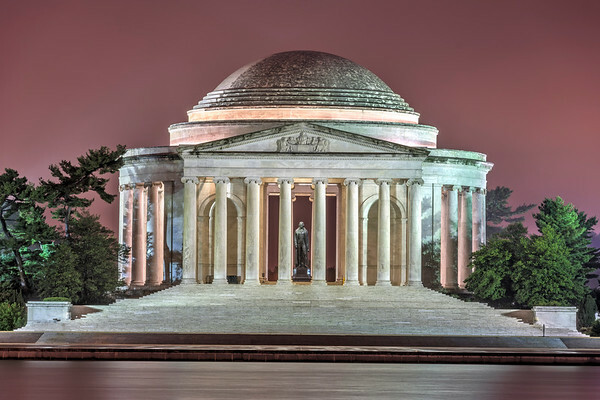 The structure shown here is the Jefferson Memorial, which commemorates Thomas Jefferson, the main drafter and writer of the Declaration of Independence, and the third President of the United States. Available in the following sizes (Rectangle B): 12x8, 18x12, 24x16, 30x20, 36x24, 45x30, 60x40, 72x48. I visited a bunch of big, American cities on a whirlwind tour of the northeast and Midwest United States, during the fall of 2018. I had one evening in Washington, D.C., and I spent it wandering the National Mall, taking photos of the famous buildings and memorials. 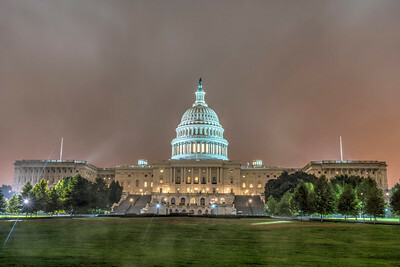 One of the advantages to visiting the National Mall at night is that there aren't a million tourists wandering about, so it is possible to photograph famous sights without crowds. 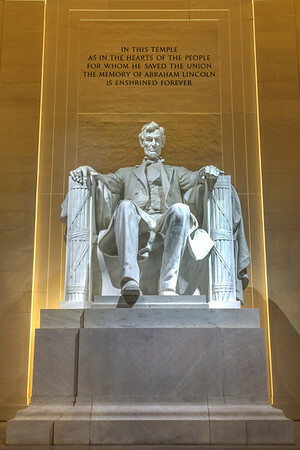 This statue is of the sixteenth President of the United States, Abraham Lincoln. Available in the following sizes (Rectangle B): 8x12, 12x18, 16x24, 20x30, 24x36, 30x45, 40x60, 48x72. I visited a bunch of big, American cities on a whirlwind tour of the northeast and Midwest United States, during the fall of 2018. I had one evening in Washington, D.C., and I spent it wandering the National Mall, taking photos of the famous buildings and memorials. It was a fairly dismal night, which resulted in a very moody sky. 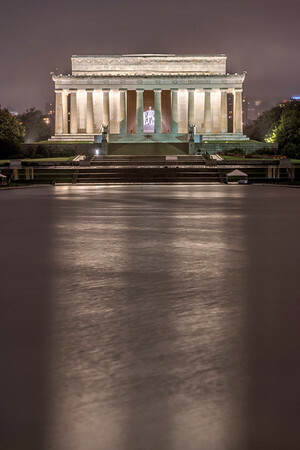 One of the advantages to visiting the National Mall at night is that there aren't a million tourists wandering about, so it is possible to photograph famous sights, like the Lincoln Memorial, shown here, without crowds. Available in the following sizes (Rectangle B): 12x8, 18x12, 24x16, 30x20, 36x24, 45x30, 60x40, 72x48. I visited a bunch of big, American cities on a whirlwind tour of the northeast and Midwest United States, during the fall of 2018. I had one evening in Washington, D.C., and I spent it wandering the National Mall, taking photos of the famous buildings and memorials. It was a fairly dismal night, which resulted in a very moody sky. 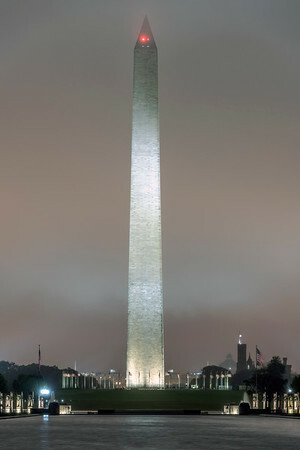 The structure shown here is the Washington Monument, which commemorates George Washington, the first President of the United States. Available in the following sizes (Rectangle B): 8x12, 12x18, 16x24, 20x30, 24x36, 30x45, 40x60, 48x72. I visited a bunch of big, American cities on a whirlwind tour of the northeast and Midwest United States, during the fall of 2018. I had one evening in Washington, D.C., and I spent it wandering the National Mall, taking photos of the famous buildings and memorials. It was a fairly dismal night, which resulted in a very moody sky. 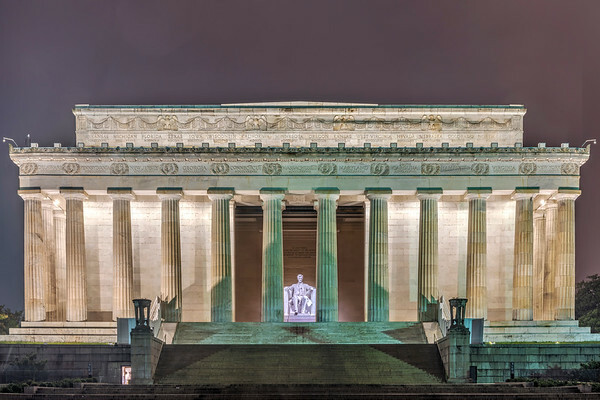 One of the advantages to visiting the National Mall at night is that there aren't a million tourists wandering about, so it is possible to photograph famous sights, like the Lincoln Memorial, shown here, without crowds. Available in the following sizes (Rectangle B): 8x12, 12x18, 16x24, 20x30, 24x36, 30x45, 40x60, 48x72. I visited a bunch of big, American cities on a whirlwind tour of the northeast and Midwest United States, during the fall of 2018. I had one evening in Washington, D.C., and I spent it wandering the National Mall, taking photos of the famous buildings and memorials. It was a fairly dismal night, which resulted in a very moody sky. The building shown here is the United States Capitol, which was completed in 1800, and is the home of the US Congress. Available in the following sizes (Rectangle B): 12x8, 18x12, 24x16, 30x20, 36x24, 45x30, 60x40, 72x48. I visited a bunch of big, American cities on a whirlwind tour of the northeast and Midwest United States, during the fall of 2018. I had one evening in Washington, D.C., and I spent it wandering the National Mall, taking photos of the famous buildings and memorials. It was a fairly dismal night, which resulted in a very moody sky. 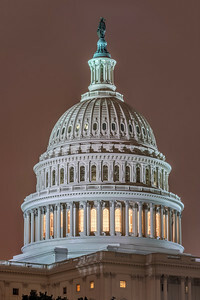 The structure shown here is the dome of the United States Capitol, which was completed in 1800, and is the home of the US Congress. Available in the following sizes (Rectangle B): 8x12, 12x18, 16x24, 20x30, 24x36, 30x45, 40x60, 48x72. The skyline shot of Chicago that I've always wanted to capture, taken at the Adler Planetarium, in the summer of 2018. Available in the following sizes (Panorama B):30x12, 40x16, 50x20, 50x20 Triptych (3 x 17x20), 60x24, 60x24 Triptych (3 x 20x24), 75x30, 75x30 Triptych (3 x 25x30), 90x36, 90x36 Triptych (3 x 30x36), 105x42 Triptych (3 x 35x42), 120x48 Triptych (3 x 40x48). 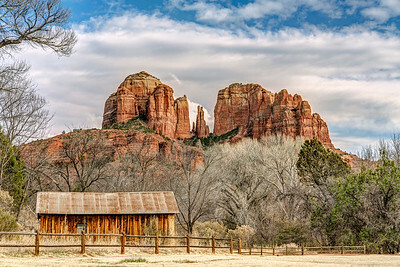 Sedona, Arizona, is about two hours north and worlds apart from Phoenix. The colossal buttes and mountains remind me quite a bit of Zion National Park, which lies several more hours to the northwest. The rock formation in this photo is one of the most famous in the area – Cathedral Rock. Available in the following sizes (Rectangle B): 12x8, 18x12, 24x16, 30x20, 36x24, 45x30, 60x40, 72x48. 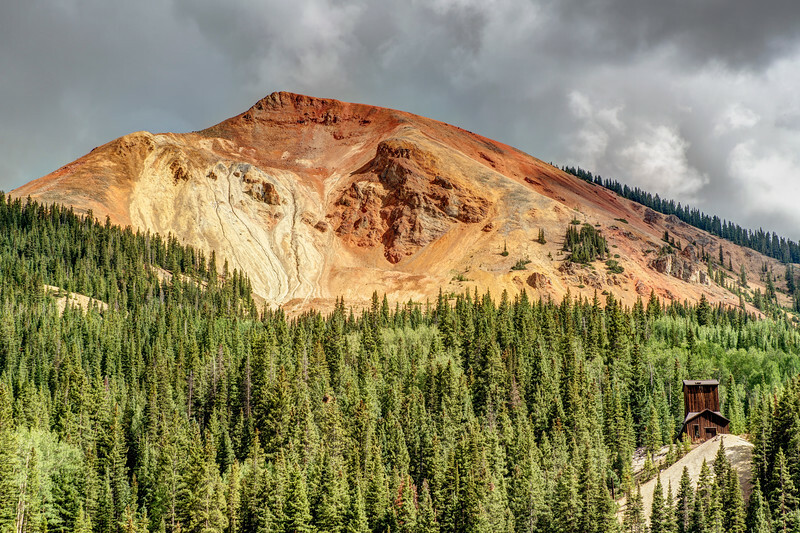 Red Mountain Pass, which is part of the “Million Dollar Highway” between Ouray, and Silverton, Colorado, is simply spectacular. A 2-lane highway that lies in a relatively remote area of the state, it switchbacks back and forth before and after the views of Red Mountain, shown here. There used to be a lot of mining done here, and the abandoned building in the lower, right hand corner is one of many such buildings that remain standing in the region. Available in the following sizes (Rectangle B): 12x8, 18x12, 24x16, 30x20, 36x24, 45x30, 60x40, 72x48. 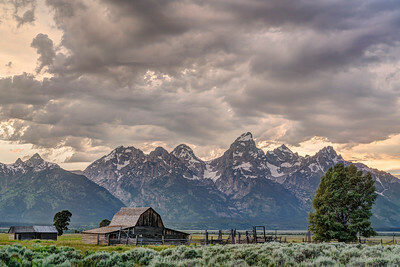 Here's yet another often photographed scene – Mormon Row, at the south end of Grand Teton National Park. Available in the following sizes (Rectangle B): 12x8, 18x12, 24x16, 30x20, 36x24, 45x30, 60x40, 72x48. 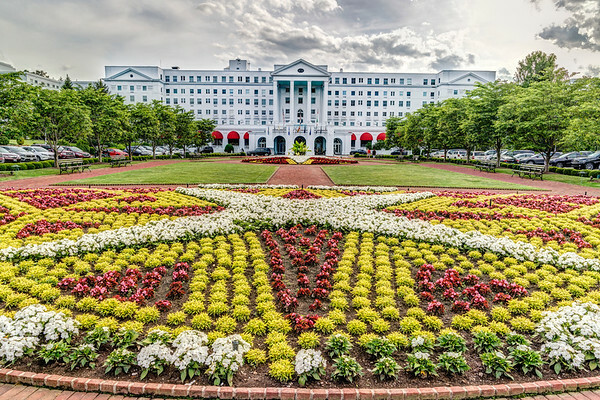 West Virginia's Greenbrier resort is steeped in history. The first hotel was built here in 1858, and today, the site occupies 11,000 acres and has 710 guest rooms, 20 restaurants, and, throughout its long history, has had 26 US Presidents stay the night. Available in the following sizes (Rectangle B): 12x8, 18x12, 24x16, 30x20, 36x24, 45x30, 60x40, 72x48. I don't do too much architectural and / or interior photography, but this is something I'd like to do more of, when opportunities present themselves, such as they did while I was attending a show in the Minneapolis / St. Paul region in the summer of 2017. While here, a friend from overseas who at the time lived a few blocks from St. Paul's Cathedral recommended I pay this colossal church a visit, and I did just that. 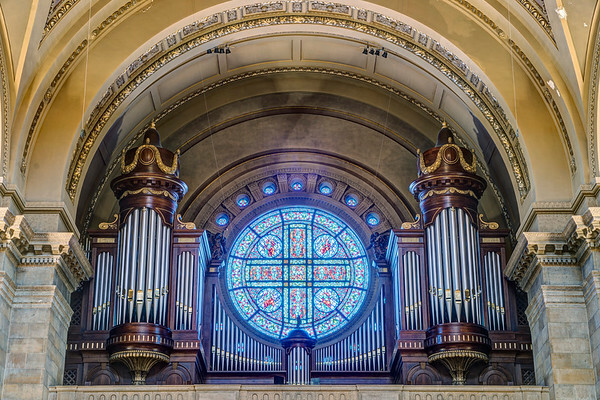 Although it may not have the age of similarly constructed cathedrals in Europe, the feel is remarkably similar. Available in the following sizes: 12x8, 18x12, 24x16, 30x20, 36x24, 45x30, 60x40, 72x48. Red Mountain Pass, which is part of the “Million Dollar Highway” between Ouray, and Silverton, Colorado, is simply spectacular. A 2-lane highway that lies in a relatively remote area of the state, it switchbacks back and forth before and after the views of Red Mountain, shown here. 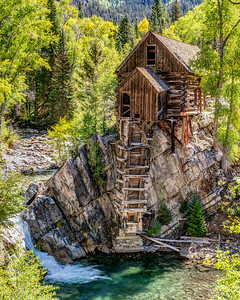 There used to be a lot of mining done here, and the abandoned building in the lower, right hand corner is one of many such buildings that remain standing in the region.